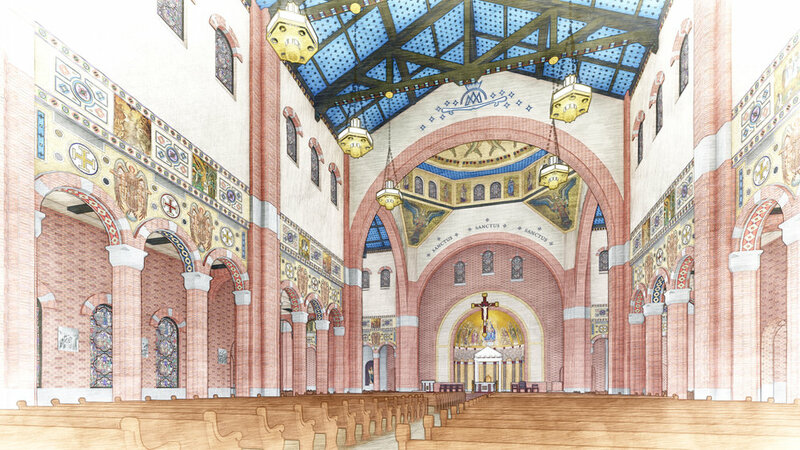 The interior conceptual design and sacred art programming for the new church at St. Mary's Catholic Center continues the Capital Campaign's theme of Beauty, Encounter, Tradition. The Byzantine-Mediterranean-flavored Romanesque church layout is infused with architectural and liturgical theology. Its traditional cruciform plan symbolizes the assembled, hierarchical, and mystical Body of Christ made present for worship in the liturgy. The east-facing apse honors the ancient tradition of hope in the Resurrection – the coming of the Son at the end of time. The cube-shaped crossing supporting an octagonal-supported dome harkens to an ancient configuration representing the temple on earth as described in Scripture meeting the dome of the heaves, the eighth day of Creation. The four massive piers supporting this structure symbolize the four marks of the Church, the four living creatures of Revelation, and the four Evangelists. A large rose window signals and reminds worshipers entering and exiting to the reality that happens within: a radical renewal of all of creation with Christ – its alpha and omega and the Word made flesh – at the center. The art is structured to place primary emphasis on communal liturgical worship, with a rich devotional offering in secondary and less visibly-focal locations. A large crucifix suspended above the altar of sacrifice emphasizes the primacy and role of this element in the church, inviting those assembled to offer their own hearts and minds to the Father in Christ the head of the Church. The dome above offers the potential for depiction of the glory of heaven made present in every liturgy: angels and saints surrounding the throne singing their unending hymn of praise – holy, holy, holy (sanctus). Below the center of the dome is the center of the crossing, where the horizontal and vertical members of the cross meet. It is here where heavens meets earth; the bottom step of the sanctuary meets the nave so that God descends and gives himself to his people in his eucharistic banquet. Geometric nature motifs stretch into the nave symbolizing the restorative nature of Christ's work in the world as it flows from the liturgy. Symbolism specific to St. Mary's abounds as well: A pink-and-blue themed Marian interior honors its patroness, acknowledging and grounding worshipers in her earthly origin, but also inspiring to imitate her heavenly calling in holiness. 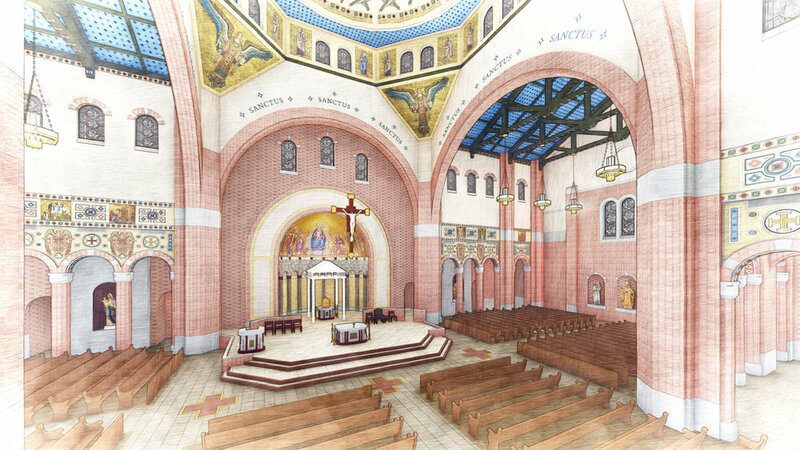 Proposed artwork for the apse dome suggests Mary as the first tabernacle of the presence of God, an invitation to follow her example upon receiving the same Christ in the eucharist. The embedded 20 mysteries of the Rosary invite a personal and moving encounter around the perimeter of the cross-shaped interior. Statues, stained glass, and paintings of ancient and modern saints – such as St. Theresa of Calcutta and St. John Paul II – depict the continuity of the faith through the ages.